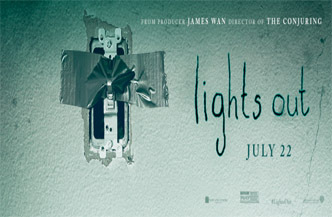 Lights Out handicaps itself in the most favorable way it possibly can, and that way is to possess an antagonist that is never explicated. The basic identity of the creature at the center of this film is explained in a plot sense, all right (at least to the bare minimum of supernatural-horror standards), but the scene where the authority figure arrives and dissects origin and motivation never arrives, and that makes all the difference. This film depends on inexplicability for most of its visceral impact. Martin (Gabriel Bateman) is having trouble sleeping, which has something to do with his mother Sophie (Maria Bello). The two live alone after a grisly accident leaves him fatherless and with a mother in the grip of something deeper than depression. And Sophie seems to talk to someone or something unseen at night. We’re introduced to the something pretty quickly, although the movie wisely doesn't make the characters wait too much longer than that. It takes the form of a shadowy woman who moves in pistonlike staccato motions, sort of like a cross between Samara from The Ring and Mama. Her name is Diana; her presence introduces us to Rebecca (Teresa Palmer). These three make up the consequential arm of the movie's cast, although a couple of characters lurk on the periphery as potential victims.